GOP presidential hopeful Michele Bachmann blamed President Obama for increasing gas prices and said she would change that. NEW YORK (CNNMoney) -- President Michele Bachmann has a promise: $2 gas. "Under President Bachmann you will see gasoline come down below $2 a gallon again," Bachmann told a crowd Tuesday in South Carolina. "That will happen." Sure, politicians promise all kinds of things on the campaign trail. But Bachmann, a leading contender for the 2012 Republican nomination, is wading into truly tricky territory. It's certainly true that prices -- now about $3.50 a gallon on average -- have risen since President Obama took office. 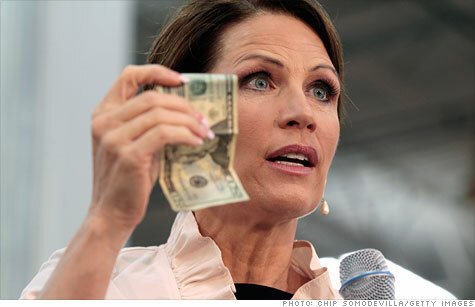 "The day that the president became president gasoline was $1.79 a gallon," Bachmann said. "Look what it is today." Of course, that's not the full story. When Obama took office, the country was mired in a terrible economic contraction. "That was in the 4th inning of the greatest recession of our lifetime," said Tom Kloza, chief oil analyst at the Oil Price Information Service. During recessions, demand for gasoline plummets as trucks pull off the road, companies cut back on travel and laid off workers drive fewer miles. "You have to be careful what you wish for because the recipe for cheap prices these days is economic disaster," Kloza said. Since early 2009, the economy has recovered somewhat and demand for crude has risen. It has even spiked in the developing world -- especially in China, India and South America. Kloza said that increased crude demand is the principal driver behind higher gas prices. "We're going to have to recognize the rest of the world has this increasing appetite for oil," he said. "If we go below $2 a gallon, it probably means there has been a lot of wealth loss and we are in a deflationary period." There are some measures that could be taken to lower gas prices, according to Phil Flynn, a senior market analyst at PFG Best. A stronger dollar would take pressure off prices, and reducing the number of miles Americans drive in gasoline-powered cars would also weaken demand. "I never say never," Flynn said. "But whether or not Bachmann can do that in four years is a tall order." Bachmann did not lay out a specific plan to drop prices on Tuesday. But her campaign website says that as president, she would ease restrictions on drilling and roll back federal regulations on the shale gas industry. According to a 2009 study from the government's Energy Information Administration, opening up to drilling areas off the East Coast, West Coast and the west coast of Florida would yield an extra 500,000 barrels a day by 2030. After OPEC got done adjusting its production to reflect the increased American output, gas prices might drop a whopping three cents a gallon, the study said. --CNNMoney's Steve Hargreaves contributed to this story.